Hallux limitus leading to proximal hamstring tendonopathy?? I have run into this presentation on several occasions, as have many of my collegues who also treat the running population. The patient presents with proximal hamstring pain, which upon examination is determined to be tendinosis of the proximal attachment. Upon further kinetic chain evaluation, it is very common, especially in the older population, to find an associated finding of hallux rigidus, or OA of the 1st ray metatarsophalangeal joint. As well, in the younger population, functional hallux limitus (FHL) is a common finding. Both of the above scenarios lead to a decrease in extension of the first ray often leading to widespread compensatory alterations in gait. A decrease in joint motion in the loaded and unloaded foot is structural hallux limitus (which can be caused by OA). In regard to functional hallux limitus, there is limitation only when the foot is weightbearing or loaded. 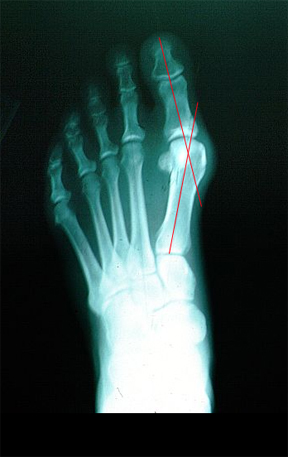 associated hallux valgus deformity (refers to the abnormal drifting or inward leaning of the great toe towards the second toe, which is also commonly associated with bunions) (Figure 1). The latter condition is often overlooked in clinical examination as pain and symptoms are often not associated with the 1st MTP joint, but rather in remote sites due to gait alterations. The 1st MTP joint represents the primary pivotal site about which the majority of extension of the lower limb occurs. 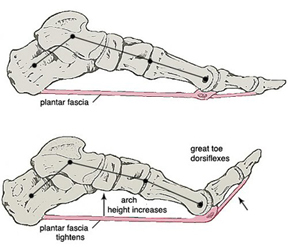 The base of the proximal phalanx also provides the insertion of the major medial slip of the plantar fascia that is vital for the creation of the Windlass effect during normal gait (this is the effect of the tightening of the plantar fascia leading to a forced supination of the the foot in preparation for the push off during gait) (Figure 2). The last compensation, Abduction compensation produces the classic pronated foot type and abducted stance position. Because the correct pathway of motion is blocked by the lack of 1st ray dorsiflexion, the person will produce an abducted foot in order to roll off the inside of the toe in order to allow for hip extension. It is this compensation, which I most often find related to the development of proximal hamstring tendonopathy. Theoretically, during the second half of stance phase when the knee bends, external rotation of the tibia will allow for the abduction compensation to occur (along with increased pronation). 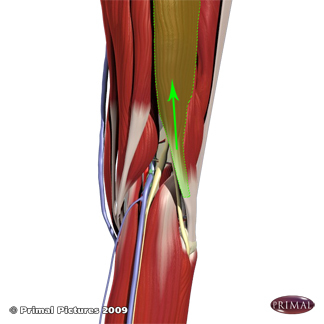 Contraction of the biceps femoris (Figure 3) insertion onto the fibular head will provide such an effect. Thus, due to the repetitiveness of distance running, conceivably the constant over activity of this muscle can lead to the break down of tendon. I find that assessment, and treatment of first ray motion (if it is indeed restricted) in addition to re-building the hamstring tendon is very effective in dealing with this condition. Have you noticed this in your practice? I have spent countless hours researching medical books, anatomy books, internet research papers, and whatever I can squeeze out of my doctors. I have proximal hamstring tendonopathy and am developing quite a bunion/haalux valgus on the same leg. I have tried to mention this to doc/chiros and the relation and have been “shoo shooed”. I am scheduled for a release of tethered scar tissue around the sciatic nerve and tendons. However, am worried if I can’t figure out the physics of my gait or stance it will all ‘tangle’ up again. I believe you have hit the nail on the head! The fascia is being pulled from way up in the hip area from misalignment.